Don't Miss This Epic Giveaway! 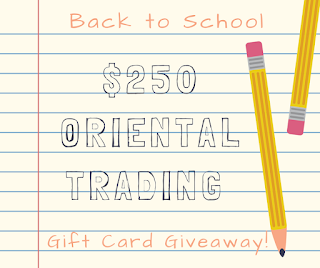 My little website has been growing, so I wanted to celebrate with a Giveaway from Oriental Trading! This is one of my (and my school's) go-to stores for classroom supplies! Click the picture below to check out how you can enter the giveaway. The giveaway starts TODAY, July 16 and ends July 30 at 11:59 pm. There are tons of ways to enter. You will have the gift card mailed to you if you win! It can take up to a week to be mailed, but it's usually mailed sooner than that. Math manipulatives - I don't care how old or advanced your students are, they STILL need manipulatives for real learning to take place!! String lights - I think they add a nice, soft light (unlike the headache-inducing fluorescents so many classrooms have) while adding some personality to the room. I got the vintage bulb string lights last year. Time timers - these make a big difference in my classroom, especially in my writer's workshop. You can read how you can use them effectively here. The next time I post, I'll be launching a series about my best tips and tricks for conferring and launching your reader's and writer's workshop effectively. What are you wondering about conferring and the workshop model? Make sure to comment below, because I'll answer your questions in the next few posts. 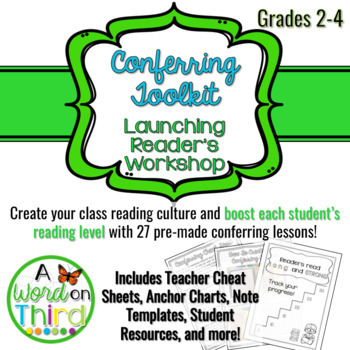 If you're already thinking about setting up for next year like I am, make sure you go download my teacher's toolkit to help you launch reader's workshop. The free product preview is a practical, easy-to-use tool that you won't want to miss out on! The conferring toolkit is discounted now, so make sure to download it while it's still at its lowest price; the price will go up in a week or two. Click here or on the picture below to see the toolkit (and, of course, to download the free preview) with my ready-to-go lessons, anchor charts, conferring note-taking templates, materials for your students, and much, much more!